Please don't pick the flowers....this cute little sheep seems to be enjoying them! This small stitchery is perfect to add a rustic farmhouse touch to your home! 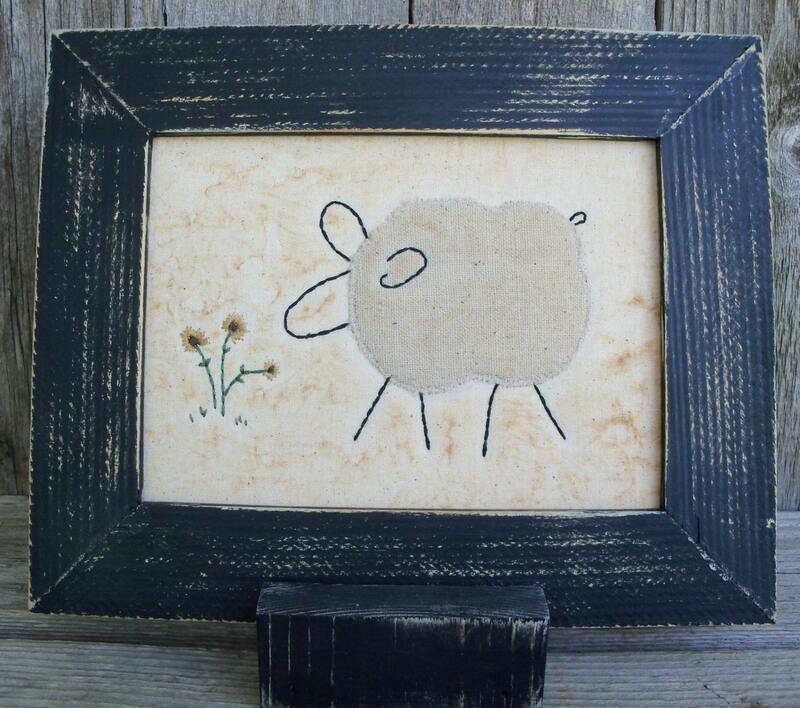 One of my original designs, this little sheep and flowers is hand-stitched on stained coffee-dyed muslin in several shades of antique white, dark gold, country green and black. The sheep's body is hand appliqued from onsaburg and batting to provide a dimensional feel to the stitchery. This stitchery is framed in a black wood frame which has been handcrafted by me. The frame is sanded to add to the aged rustic appearance of the stitchery, which is perfect for your country or cabin decor. This stitchery measures approximately 7 1/2 inches x 9 1/2 inches and comes with a sawtooth hanger on the back for your convenience. This is a made-to-order stitchery. Please allow 10 - 14 business days for me to stitch and frame your stitchery and get it shipped off to you. My frames are made from 1 1/2 x 1/4 inch (3.81cm x .635cm) pine and are backed by 1/4 inch (.635cm) wood. They are made to provide a rustic country feel to compliment my stitcheries. I absolutely LOVE IT!! Beautifully stitched and delivered in a timely manner. Thank you so much.